Nothing is more frustrating than a trail of dirty dishes across the counter! Here's how to do dishes (and fewer of them!) without spending hours scrubbing and sweating over your kitchen sink. When we moved into a house with an actual dishwasher, I swore that I would never let dirty dishes get out of control again. Ha! The famous last words of a die-hard perfectionist. Before too long, I fell into the bad habit of relying on the dishwasher too much. 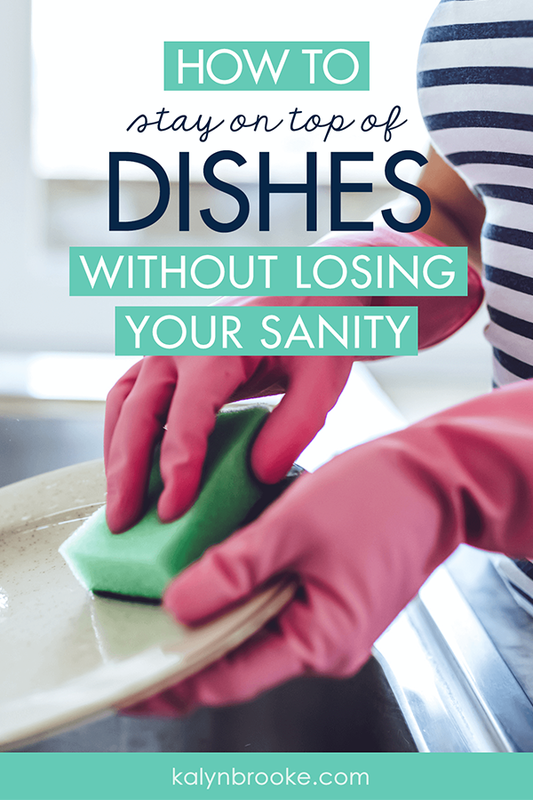 To the degree that I wouldn't wash dishes right away and instead, I piled them in the sink until they multiplied into a trail of dirty dishes strewn across the countertop. Why didn't I just empty the dishwasher right away and start reloading it immediately, you say? I pride myself on being a hardworking woman and I certainly know how to do dishes, but I'm going to guess that #1 reason why any of us skip tidying or cleaning as much as we should is because…well…we just don't want to do it. Pure and simple. We'd much rather spend time reading, playing on the floor with our kids, snuggling with our pets, and out on coffee dates with friends. Those activities are much more fun than tackling the overflowing mound of dishes in the sink. And don't get me wrong, those things are more important. Self-care and investing in our relationships trump cleaning! But the fact remains: if you're eating at home (whether you want to stay healthy or slash your grocery bill or both), you're dirtying dishes…EVERY. SINGLE. DAY. 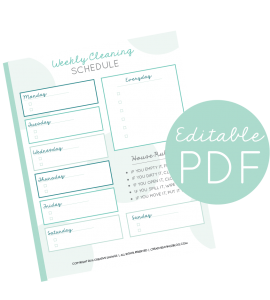 So I'm going to try and make it as easy as possible for you to overcome this annoying chore. Yep, we're talking about how to do dishes (and fewer of them)! The following tips might not sound like your typical Buzzfeed article; you won't find below “10 mind-blowing hacks to guarantee you never have dirty dishes again!” But done consistently, you'll combat the overflowing sink issue quickly, easily, and never let it get out of control again. I'm kind of joking, but also somewhat serious. Hear me out. 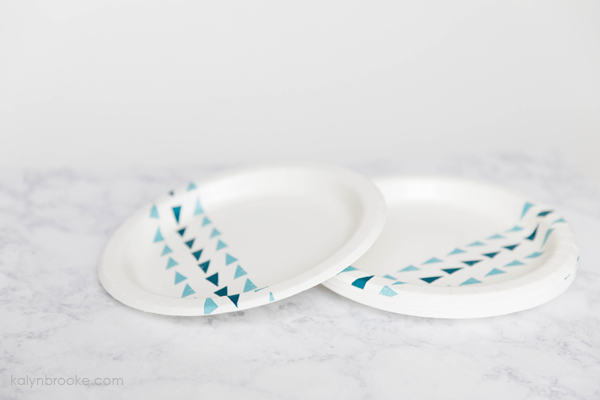 When life gets hectic or you have people over and don't want to create an insurmountable amount of dishes that crust over in the sink while you spend time with your guests, paper plates become your go-to life saver. Of course I'm not saying you have to use paper plates every day. That might pinch your budget (but if it works for you in a busy season, go for it!). Still, having them around can make a messy meal or busy week a little easier. For any dishes that can go in the dishwasher, don't even let the bottom of that cup or plate touch the countertop (or sink!). Quickly rinse and load it into the dishwasher right away. 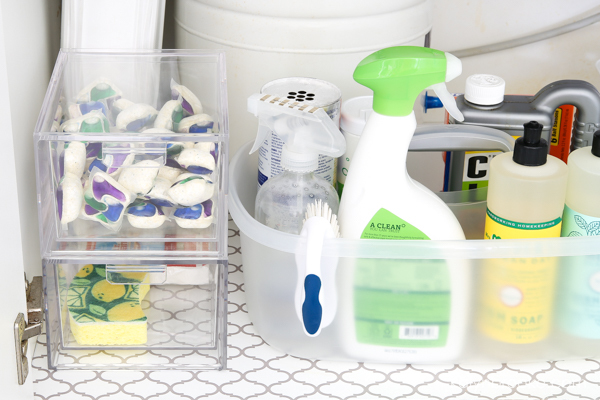 With less in the sink to sort, you'll find it much easier to tackle the bigger dishes that actually do need to soak. This is one habit that will take some practice (especially if you're trying to get the rest of your family on board), but don't give up. 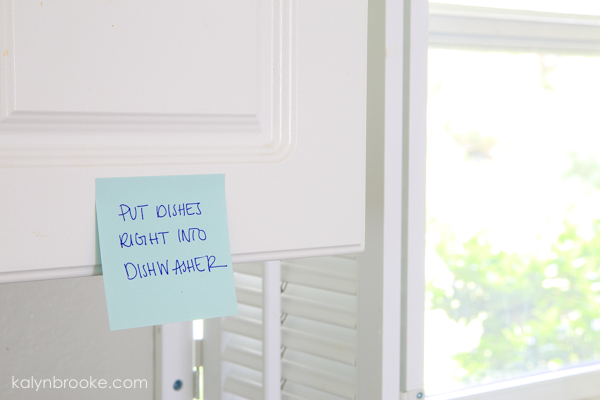 Place a sticky note at eye level as a not-so-subtle reminder until this task becomes second nature for everyone in your house. I'm here to testify, this really works! 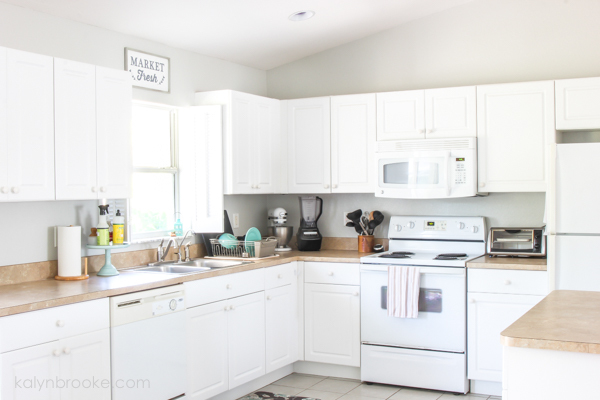 Imagine this with me for a moment: You wake up every morning and walk into a clean kitchen. Ahhh. Don't you feel more energized to whip up breakfast and tackle your to-do list when you don't have a sink full of grimy dishes from last night's dinner staring back at you? This is possible when you aim for a dish-free sink every night as one of your daily habits. Tell yourself that you can't crawl into bed unless the dishes are done—and stick to that! And psych yourself up that this task is going to take 10 MINUTES, less if you keep up with it on a consistent basis. Bonus Points: This task will be easiest to accomplish when it's part of your evening routine, or if you tack it onto the end of every meal to have even less to do at the end of the day. I personally strive to do all the dishes right after supper because I'm not yet tired enough for bed. A.K.A I'm less likely to skip this chore! They say multi-tasking is a myth, and I wholeheartedly agree…unless you're working in the kitchen. Use as few dishes as possible when making a recipe. 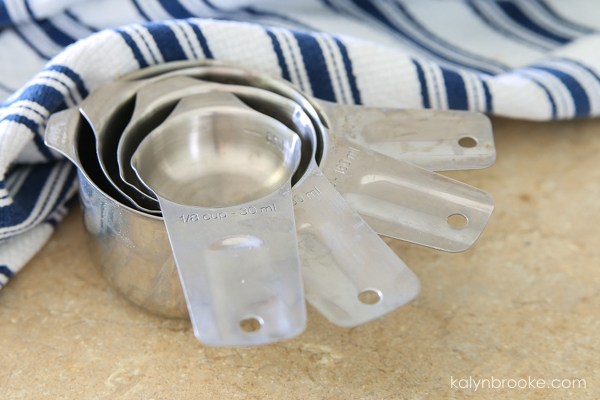 When I'm baking cookies and need to use the teaspoon twice, I just make sure I measure the dry ingredient(s) first before the liquid ingredients, so I can re-use the same teaspoon. I'll do the same thing if the recipe calls for 1 tsp and 1/2 tsp—you can just use the 1/2 tsp twice. Refill the same cup or water bottle throughout the day. Joseph and I each have a designated Tervis cup so we make fewer dirty dishes and don't have dozens of cups hanging out on coffee tables or counters. Clean while you wait. While waiting for the water to boil or for that soup to simmer or for the casserole to bake in the oven, use this time to clean up and wash dishes before the next step in the recipe. Even if you only get a few done, that's less you have to do later! Let the dishes drip dry overnight in a drainer like this one with a thick drying pad underneath so you don't have to waste time hand-drying them with a towel. Create fewer dishes at lunchtime by packing lunch containers with leftovers the night before. This is a tip from my friend, Rosemarie! Think about where you can double up your efforts to make less dirty dishes in the kitchen AND keep the dirty dishes you have from getting out of control. Nothing is more frustrating than opening your dishwasher door to find dried-on nastiness peeking up at you from your plates. Because of this, I practically washed dishes by hand before putting them in the dishwasher, which totally negates the need for a dishwasher! That is, until I splurged on the best dishwasher soap ever: Cascade pacs. Now I just do a quick rinse and Cascade takes care of the rest. Dried-on maple syrup has nothing on these powerful pacs and I save so much time! The cheapest place I've found to purchase these pacs is through Amazon's Subscribe & Saveprogram—you just add them to your S&S list and every few months, Amazon will send you a new box. Don't they look super cute in this little under-the-sink organizer? For when washing by hand is inevitable, you need a high quality dish soap to make this task as painless as possible. 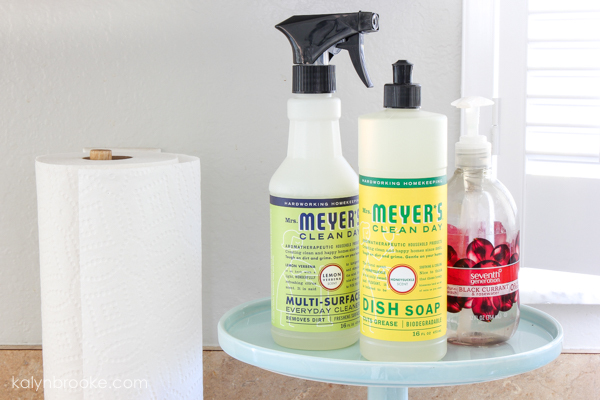 I've tried SO many dish soaps in the past that do absolutely nothing; it's so frustrating to scrub dishes over and over again just to get them clean! I also love this Bubble Up Soap Dispenser and Brush Set. This makes cleaning dishes by hand SO much easier because the bristles can get into all the little corners and crevices! If you decide to snag one, sign up through Grove using this link first, because you'll also get a complimentary 5-piece Mrs. Meyer's set. Finally, my sink just wouldn’t be the same without the sponge holder I have that attaches to the side of the sink and helps keep my sponge dry. Necessity! 6. Make doing the dishes fun! Well, as much as you can, anyway! Listen to music or podcasts while you do the dishes as a way to keep your mind off the task at hand. 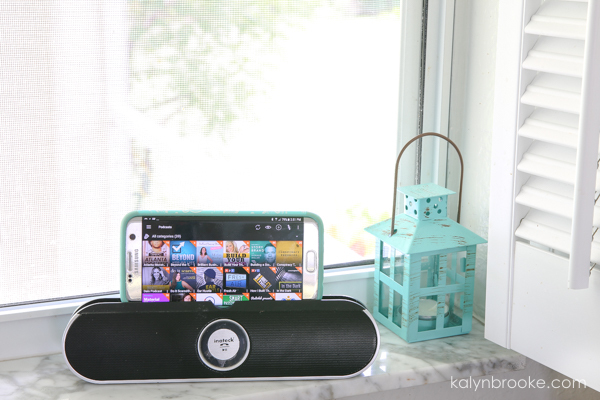 If you find it hard to hear audio on your phone, get a bluetooth speaker so it connects automatically and you can turn the volume up higher. My go-to music right now is show tunes—especially from The Greatest Showman! I can totally do the dishes with Come Alive blasting in the background. Dishes go so much faster with one person washing and the other drying, especially if you have a particularly large amount of pots and pans leftover from dinner. But teamwork is important in other ways too. Explain that dishes must go in the dishwasher right away or that they need to rinse out their smoothie cups so the food doesn't dry all crusty (ew!). Whatever routine you want them to follow, make it easy for them to follow and obvious, but be patient. Sometimes you feel like you're repeating yourself but it's worth your kitchen's (and your relationship's) sake! The biggest takeaway that will make everything fall into place is to make dishes part of your everyday routine. In other words? It's all about consistency and discipline. You have to push past the “don't-want-to's” (as hard as it is!) and create a new “must-do” in order to make the rest of your life easier. I'm not always awesome at this, but I keep trying, and on the days when I do follow all of the aforementioned tips throughout the day, it always amazes me how few dishes I have to do before bed. Instead of spending 30 minutes scrubbing (and sweating!) over all the dishes I let multiply, it takes 5-10 minutes tops to take care of them with my new routine. And that, my friend, leaves less clutter in your mind and your kitchen so you can spend time doing what you love with the people you love, guilt-free. 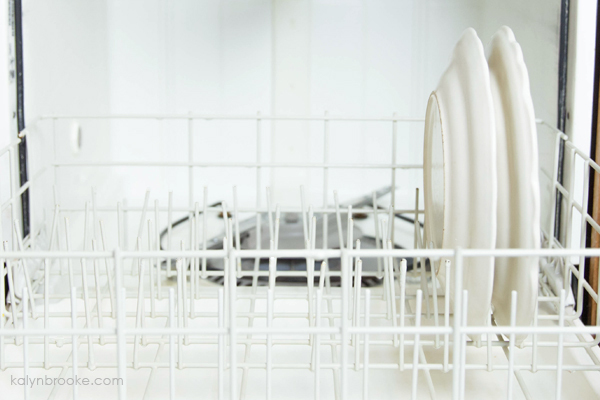 Do you have an easy hack that makes dish washing easier? Yes yes yes! I do most of these now and you’re right, it saves SO much time – my husband actually got me started on several of these when we got married a year ago. Although I’m a pretty neat person, letting (rinsed!) dishes pile up was my weak point. 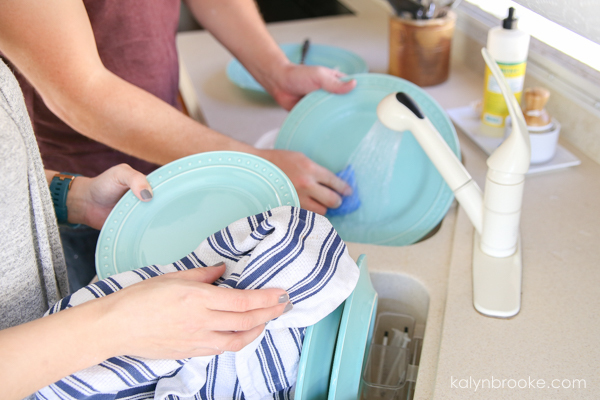 We wash all dishes after dinner that weren’t taken care of while cooking, leave them to dry overnight, and then unload while making breakfast (and then wash our few breakfast dishes right away). I hadn’t thought of #5 and #6, but a similar thing I would add is multiple sponges – especially for those (like me!) without a dishwasher. We use a soft “non-scratch” sponge for most dishes, the green “heavy duty scouring pads” for stuck on food, and a stainless steel sponge (“steel wool”) for stainless steel pots & pans. It’s still crazy to me how fast they can pile up if we don’t stay on top of them. I think I may need to adopt your multi-sponge approach. Right now we just use one sponge but it can get nasty pretty quickly dealing with the caked on food or cleaning a frying pan that was used to make scrambled eggs.